Only some people are meant to go on mission trips--I'm not one of them. 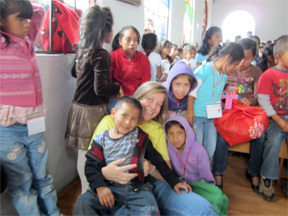 Two of our members went to Guatemala to help build stoves and teach Vacation Bible School. So what's that got to do with me? Or you, if you don't feel called to leave the comforts of home? She planned on building stoves when she arrived in Guatemala. 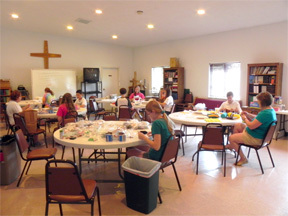 A few days before leaving, she received a phone call asking her to do the crafts for Vacation Bible School. Dorinda does a lot of things but crafts is not on her list. That's where others came in to help. This is something I could do! 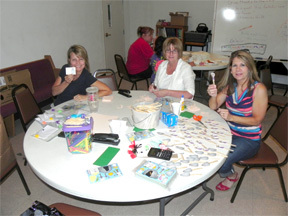 I'm in the middle of two fun women and we were a bit crazy by the time the photo was taken.. People came and went all afternoon punching holes in paper plates, sticking stickers on Popsicle sticks and assembling over 200 craft kits to be used. Then there was the fear of not being able to stick them all in Dorinda's suitcase! Not a problem as I never travel light, I sent Ed home for my suitcase. The one I take to conferences and bring back loaded with books. That's a strong young man to pull that heavy thing up the street! Good thing Dorinda found him. These are a few of the kids who put together the crafts assembled in Illinois by women who couldn't go to Guatemala. 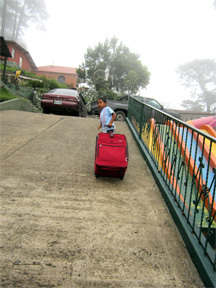 Mission trips like this one to Guatemala need more than one kind of person to make things happen. Dorinda may not have been crafty, but she didn't have to be. 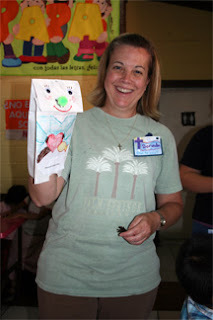 God provided hands and materials for her to use with the Guatemala children. I may not take a far away mission trip but God has people who function well without Diet Dr Pepper and 24 hour internet, like Dorinda. I'm so glad I had a very small part in the joy. Plus I can say my suitcase has traveled out of the USA. Have you ever been on a mission trip? Will you go again? Would you like to go or are you more like me willing to help from home? Thanks for such a postive, can-do spirit! Many hands bring joy to the Father! I am more the work-behind-the-scenes kind of missionary, though you never know when the Lord will use you (check my blog in the next couple of days for that story). My one crazy dream? To live in Vietnam for 6 months teaching English & doing missions work. I'll be watching your blog for that news, Liz. I can see you carrying your dream. Shelly, that is wonderful. At one time my husband and I were going to do that with our church but that dream may not occur. He has to be able to retire and that doesn't seem possible. Wow, cook for over 100 people? I am impressed! I've never been on a mission trip, foreign or domestic. My husband is definitely NOT interested in traveling outside the US or to a mission field within the US. I sometimes think I'd like to do a mission but so far, no undeniable calling to pack my bags. Missionaries have my full respect and support. They are brave and willing to step outside their comfort zone. I'm a home body. I certainly enjoyed your post about Dorinda and the photos. Thanks for sharing! They have my highest respect as well. Like you I enjoy reading about their work or listening to them speak. I'm a home body, too.